First they made more than 100 delicious vegan sandwiches. Then they taught us how to bake with whole grains. Now Celine Steen and Tamasin Noyes have teamed up again to show us how to make delicious bite-sized eats with their newest title, Vegan Finger Foods. Featuring more than 100 finger-friendly recipes than span from from sweet to savory, elegant to casual and simple to decadent, VFF has something for everyone. Celine’s gorgeous photos grace every few pages of the book, making it delight to look at as well as an inspiration to cook from. As with their previous titles, Tami and Celine have included helpful icons with each recipe that indicate whether it is quick & easy, make ahead and/or has gluten-free potential. What I love most about VFF is the endless creativity and care that’s clearly been put into each recipe. Something magical happens when Tami and Celine put their heads together to create a cookbook, and it’s always a joy to see what they come up with. From pulled jackfruit mini tacos to black forest jars to corn fritters with tomato-thyme gravy and portobello BLTs, there is something for every taste preference and occasion! I decided to try VFF’s Better Buckeye recipe first which produced an amazing melt-in-your-mouth texture with a subtle hint of cinnamon that was perfectly finished off with a twirl of melted chocolate and a sprinkle of sea salt. Since I loved them so much I’m excited that they’ve not only agreed to let me share the recipe here, but are also offering a free copy of Vegan Finger Foods through this post! To enter, just leave in the comments section your favorite finger food and I’ll randomly choose the winner on May 18. Please leave in your comment your email or some way to contact you in case you are the winner. Shipping is limited to US and Canada only. Good luck! Congratulations to Tina, winner of this giveaway! Published by Fair Winds Press, 2014. Buckeyes are a tradition in Ohio, but we opted to update them. 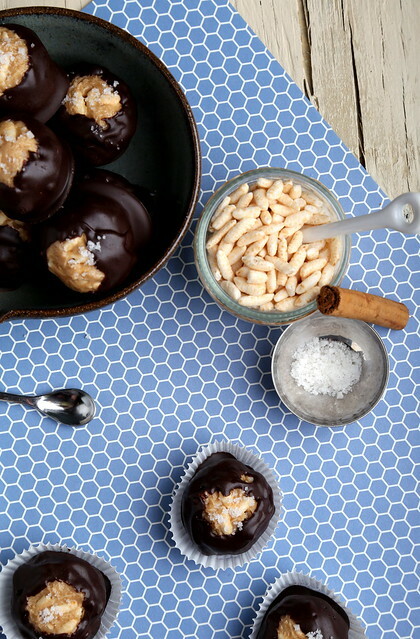 We reduced the amount of sugar, so ours aren’t cloyingly sweet, and added puffed rice cereal for a surprising crunch! While we were at it, we added a bit of cinnamon, too, because peanut butter loves cinnamon. And so do we. Line a rimmed baking sheet with wax paper or a silicone baking mat. Using a hand mixer, cream the butter, peanut butter, and vanilla in a medium-size bowl. Mix in the powdered sugar and cinnamon. The mixture may be slightly crumbly. Add up to 1 tablespoon (15 ml) milk, if needed, to make an easy-to-form dough that is the consistency of very thick frosting. Using your hands, mix in the cereal. Put the mixture into the freezer for 15 minutes (up to 45 minutes), until the mixture is firm enough to shape easily. Roll into 12 balls, using 1 tablespoon (20 g) of dough per ball. Place the balls on the baking sheet, and refrigerate while melting the chocolate chips; they can also be frozen for 30 minutes to help them firm up, if necessary. Using a double boiler, melt the chocolate chips over simmering water, stirring constantly. Remove the buckeye balls from the refrigerator. 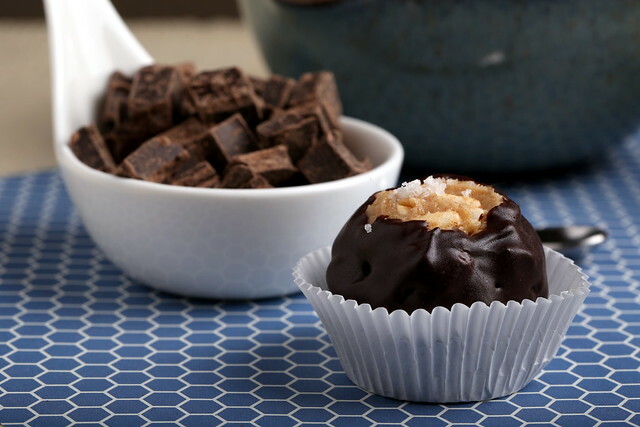 Stick a toothpick into a buckeye ball, and dip into the chocolate mixture to nearly cover, but still leaving a bit of the dough exposed to look like a buckeye. Return to the baking sheet, and repeat with the remaining balls. Sprinkle each with a pinch of salt. Refrigerate for 30 minutes, or until the chocolate is set. Store in the refrigerator in an airtight container for up to 1 week. It’s important to use no-stir peanut butter here (brands vary), or you’ll need to dramatically increase the sugar to get the right texture. 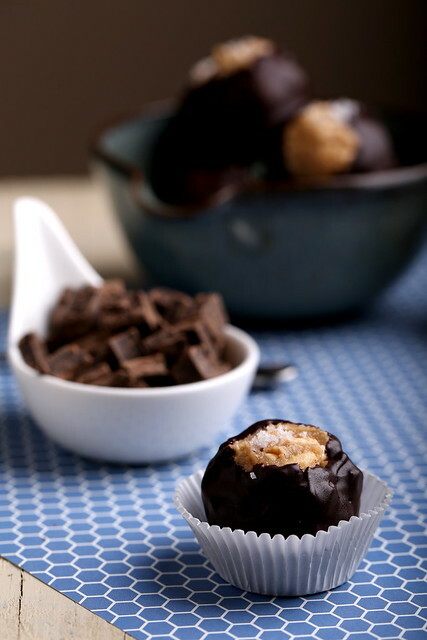 If you don’t have a double boiler, see the alternative method in the Nutty Caramel Chocolate Bites (page 141). Pita chips and hummus will always be my favorite finger food 🙂 thanks for offering the giveaway! The buckeyes look delicious. Love a great white bean dip — easy to make and really tasty! Although I have to say, that my husband who is from Ohio would love to get his hands on those buckeyes! Oh, I can't wait to get my hands on this cookbook! Vegan Sandwiches Save the Day is one of my all-time favorite cookbooks. These ladies know how to create some culinary magic! My favorite finger food is bruschetta. When tomatoes are in season, there's nothing better than fresh tomatoes and balsamic on garlicky toast. My favorite finger food is popcorn with whatever I feel like seasoning it with! My favorite finger food? Definite nachos. I would eat nachos all day every day if I could. my favorite finger food is baby carrots and guacamole! Buckeyes are probably my favorite finger food! I'm totally addicted to cauliflower buffalo wings…yumm!!! Chik'n Nuggets with chipotle dipping sauce..yummy goodness! My favorite finger food is mushroom puff pastry bites with tarragon and cashew cream. They're a lot of work to make, but totally worth it! Chips and dip of any kind. I suppose my favorite is hummus and chips but I bet that I'll have lots more with this book. Thanks for the chance! I've gotten on the cauliflower buffalo wing train and I don't think I want to get off. My mum's rosemary, garlic and lemon-marinated olives. My favorite finger food is fruit, specifically blueberries! Thank you for the giveaway. kelly.garbato -at- gmail -dot- com. My favorite finger food has got to be taquitos dipped in a avocado salsa! I'm really excited for this book because I agree that Celine and Tami are an amazing duo! Carrot sticks and sriracha hummus. Perfect combination of sweet and spicy. Sandwiches with Justin's vanilla almond nut butter or PB& Co's dark chocolate dreams (chocolate peanut butter)!! My favorite finger food? Probably veggie pate on toast points… Goes really well with a nice glass of wine! Could've used this book to come up with an interesting (and easy) vegan appetizer to bring to an omnivore party last weekend. Love hummus/guacamole/bean dip but not enough wow factor. Settled for artichoke tapenade in puff pastry pinwheels….meh. Agree with all the salty/crunchy suggestions listed above but popcorn with nooch heads the list. I love popcorn. I am a new(ish) vegan, so I would love to get more ideas on things to serve! I have never had a buckeye, but this makes me want to try them out!! Oy, I have so many favorite finger foods. If we are going actual food, then mozz sticks (vegan of course), potato skins. 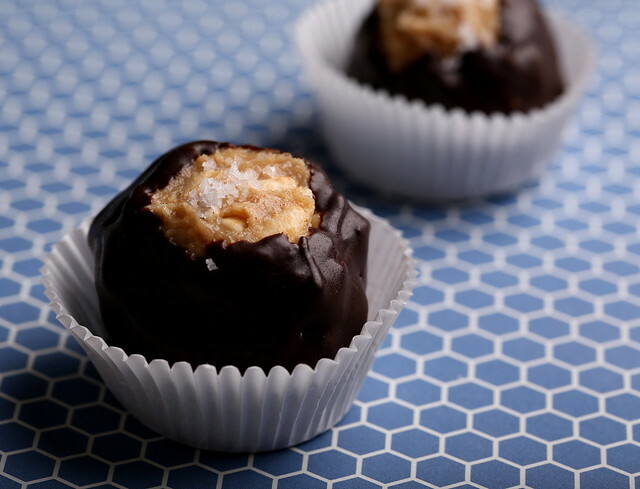 If we are going sweets, peanut butter balls and fudge! Stuffed mushrooms! cole sarar at gmail dot com. Do I really have to pick ONE finger food? If so, any kind of french fry will make me swoon! Thanks for the giveaway. I love all things finger food. My favorite finger food is dehydrated sweet potato chips and nut butters – way too addicting! Finger foods…hmm…I love veggies/crackers/chips with hummus. That has to be my all-time favorite. But I would love to expand my horizons. I think when you are hosting a party or get-together that it's great to have plenty of sweet and savory finger foods around. Plus, what a better way to get people to go vegan than to offer them delicious treats? Guacamole or stuffed mushrooms! sorry missed the contact part, as i was salvating too much starting at the buckeyes. contact me through vegsarasota.com 🙂 ~Liz! I don't know if it counts as a finger food per se but I love vegan nachos! You can always contact me at owsla@facebook.com. I love chips and dip! Any kind of dip is great! Favorite finger food is definitely hazelnut spread and salted pretzels. Or chips and salsa! Without hesitation, Chips and Guacamole! I love something cheesy and creamy in my finger foods, it's hard to list a favorite. Either fried eggplant like from tapas restaurants or fried mushrooms! Chips and guacamole!! Yum!!! 🙂 Thanks for doing the review and giveaway! Would dipping one's finger into the peanut butter jar count? Ok, I can be demure and use a butter knife to slather peanut butter on celery sticks sometimes. My favorite finger food is mushrooms filled with quinoa and herbs. When I make these at parties they are always a success. Fried potstickers, creamy sushi rolls, or whatever with potatoes will make me a happy vegan. Email is found on my Blogger account.